Fresh onto the Cincinnati restaurant scene, Muse’s executive chef is busting preconceptions about fine dining, one (healthy) dish at a time. What was your culinary background before Muse? I’ve been in the industry for quite a while. I started out in Arizona—that’s where I grew up. And then I moved to New York to go to the Culinary Institute of America. I graduated from there with my bachelor’s, and I ended up going to NYU and getting my master’s in food studies with a focus on food systems. Then I worked at Hudson Valley Foie Gras in New York, and that’s where I was working when I moved here. What made you want to make the move to Cincinnati to work at Muse? Honestly, I didn’t know a lot about Cincinnati. I knew there were a few chefs here who were doing cool stuff; specifically, a couple people [I knew] were graduates of CIA were here in Ohio. They were in Columbus, and they were like, ‘Yeah, the [Cincinnati] food scene’s really cool,’ and I just really fell in love with the concept that Anne, [Muse’s] owner, wanted to do. I was really excited for that concept, in particular, and that’s what made me come here. I never really thought about coming to Cincinnati before she called me. How would you describe your food philosophy? I think that food is really the only preventative medicine in this country. Eating not only healthier versions of food but also socially conscious and sustainable food is extremely important to me. I think that as chefs—especially as young chefs—it’s our job to educate the public on foods they should be eating and foods that are socially conscious and ecologically sound and good for your body. Do you feel like diners are more aware of those considerations now and that they’re seeking out more sustainable and healthy options? Absolutely. I think people want to know where their food comes from more so than they did in the last 20 years. Knowing the source of your food is really the first step in understanding sustainable practices and [things like] combating soil degradation and other environmental issues. I think that a lot of consumers are really hip to that now, and they’re getting more and more hip [to it] every day. I think it’s our responsibility as chefs to give them information that they can take with them and use outside of our restaurants. The idea of “food as medicine” is a prevalent theme at Muse. Could you explain what this means? Yeah, I mean, for example, we pay our doctors to keep us healthy, but we don’t pay our farmers to keep us healthy, and I think we should. I think that whatever you fuel your body with [reflects] how your body is going to perform, just like a car. So I think that eating foods that help digestion and help combat illnesses and things of that nature and lowering our [excess] calorie intakes and [exercising] portion control, I think a lot of those things are exactly what we talk about when we talk about food as medicine. Is there a misconception in fine dining that decadent food can’t be healthy? Absolutely. I think we’re all still under the impression that something that’s laden with butter and cream and salt is flavor, and I think that we’ve kind of lost track of what foods actually taste like without all of those added ingredients. It’s engrained in us. We think of salt is love and fat is flavor, and that’s been engrained in [chefs] from culinary school to even people like organic chefs who have come up through the ranks. It’s just the old-school way of thinking. Muse is known for its abundance of vegan, gluten-free, and paleo offerings. Why do you think it is so important to accommodate a variety of diets in your menus? I think everybody deserves to go out and have an amazing experience at a restaurant with all of their friends or family. Everybody having a different dietary restriction or having allergies—things like that—that they feel uncomfortable in a restaurant, because a lot of people make it seem like it’s a hassle for the kitchen. I think it’s really important that we embrace those diets and allergies and let everybody have that perfect experience with food and really create that food memory and create that fun experience that you get to have when you go out to eat. Creating those menus, do you ever find it limiting? No, I actually find it the complete opposite of limiting. I think it’s challenging, but I think it’s extremely fun because you get to be inventive, and you get to dig into your own creativity and find ways of creating a beautiful menu for, say, a vegan who is grain-free. That’s a challenge, and it really just challenges our creativity and it makes us become better chefs and better at our crafts. Speaking of creativity, what ingredients or techniques inspire you most? I really like searching out alternative means to things like flour or grains that a lot of people can’t eat or don’t eat, especially with gluten allergies coming up on the rise. I really get inspired on using those alternative products. Recently I’ve really gotten into using banana flour in baking, and that’s one of my favorites. It’s got a low glycemic index, but it’s got a really good flavor to it and it binds well. Using things like flax eggs instead of eggs, and kind of combating the industry standard as far as using CAFO (concentrated animal feeding operation) foods and being able to use alternatives where we’re not adding to the problem, we’re taking away from the problem. 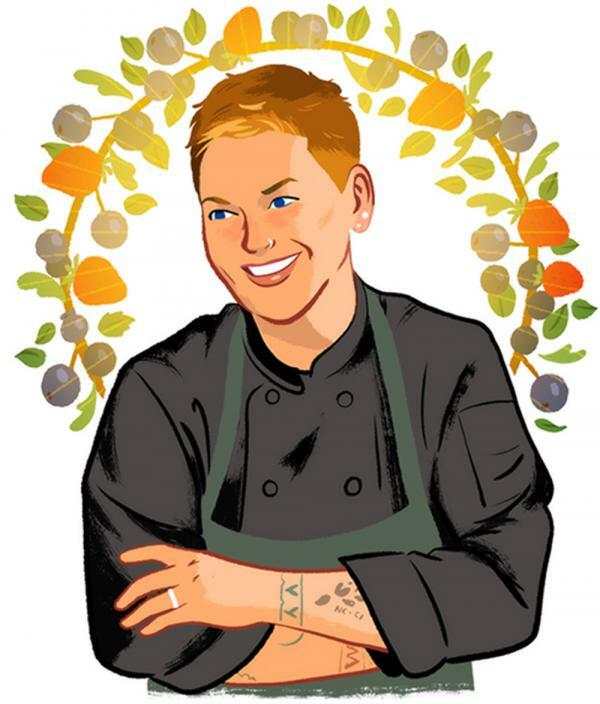 You’re teaming up with Revolution Rotisserie’s Dana Adkins for a collaborative dinner. Why was this something you wanted to do, and do you foresee doing more of these in the future? He’s been a huge influence on me and has been really, really welcoming in my transition from New York to Cincinnati. I think it’s really important to have other chefs come in and collaborate with you, because not only are you creating a whole new experience for a guest because you have two chefs who are working [together], but as the chef hosting the collaborative, I get a chance to learn from him. I get a chance to delve into his head and see what flavors he’s pulling out and really play into that. And I think it builds camaraderie in the chef world here in Cincinnati, so yeah, I’m going to be doing a lot of those as we move forward. As a newcomer to Cincinnati, what are you enjoying most about the culinary scene? How explorative and how innovative it is. It’s an area that may have been overlooked in the past, but it’s definitely not being overlooked anymore, and that’s super exciting. And just the camaraderie between the different chefs and the different restaurants, how welcoming and how helpful everyone is, and how everybody knows everybody, and everybody goes to barbecues together. It’s a family environment, instead of this competition, which you get in places like New York City, so that’s definitely been the best part.